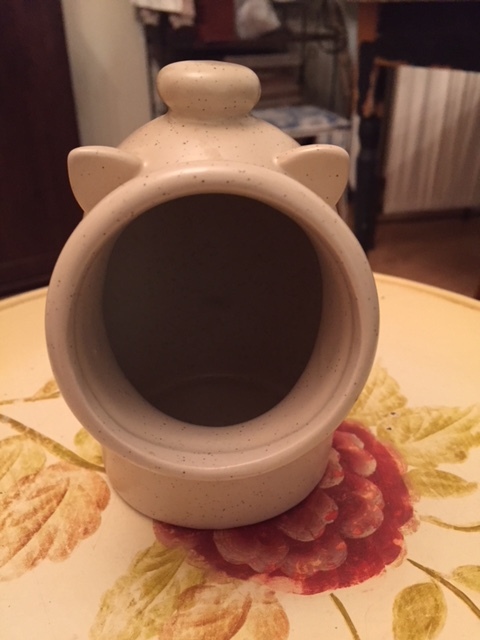 My vintage find of the week was this adorable Salt Pig, I literally squealed (get it – squealed) with delight when I saw it calling to me from the bottom shelf at a local thrift store. I’ve wanted one ever since I saw Jamie Oliver use one on his cooking shows. It’s not like they are expensive actually purchase one at any good cooking supply store, I just never really got around to buying one. What makes this one special is the fact it is Vintage. When I saw this little fellow with his big wide mouth, cute little ears and curly tail, I knew he had to come home with me. I paid $2.99 (cdn)for him and was very pleased, they retail from $17.50 upward to $39.99 (cdn). 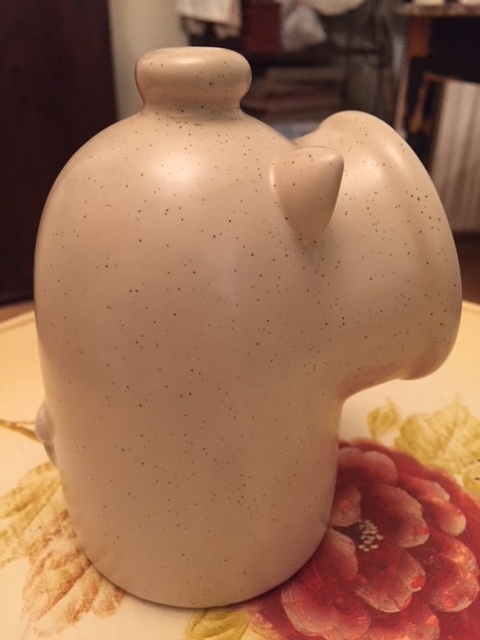 Here is a little bit of history and some good tips on why it a good idea to own a Salt Pig. A popular thinking on how it got it name is that the round and snout-like opening is similar to that of the snout of a pig. 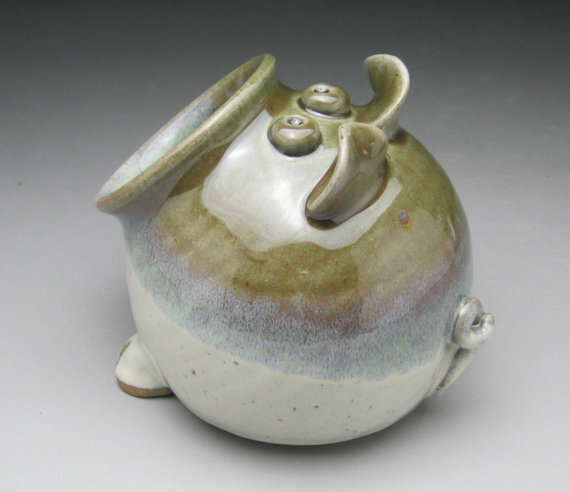 It is also widely known that an old Scottish dialect revealed that “pig” was a common word for an earthenware jar or pot. A salt pig was simply an earthenware jar for salt. There are so many versions of them out there (this one shown below is particularly adorable) if you have salt in a dish that you use to cook with – Viola! you’ve got yourself a Salt Pig. If you don’t have a helpful salt pig putting a little bit of rice in with salt works wonders, too. Salt pigs have large openings which make salt easily accessible during cooking. They’re often sold with little scoops, who doesn’t love a little scoop? Many people keep their pigs near cooking surfaces and the curved tops keep out grease splatters and sauce drips that find their way quite easily into open bowls and flat salt dishes. If you have one, please leave me a comment and tell me if you love yours?? Well that’s all for this post and I hope you come back next time as I am sure I will have lots more to share with you. 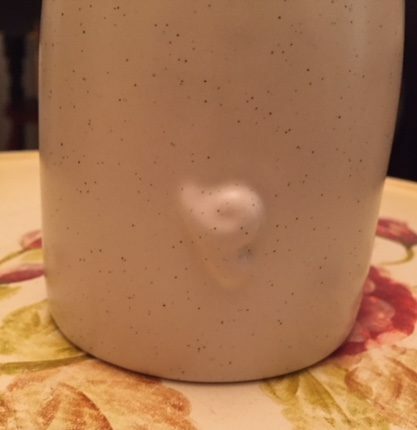 This entry was posted in Uncategorized, vintage and tagged pig, round, salt, salt pig, seagrove potters, snout, tail, vintage. Bookmark the permalink. too cute. That would look great on any counter. Like the Seagrove potters one also.